Eagle Center and Stockholm Pies! National Eagle Center and Stockholm Pies! Doesn’t a hot chicken pot pie sound yummy? 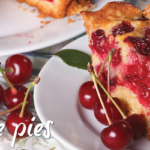 Enjoy this winter comfort food and then choose your favorite pie slice for dessert. We’re going to the world famous Stockholm Pie Company for lunch! You'll have time to browse and shop their general store and even purchase a mini pie or two to take home! 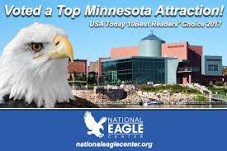 We’re then off to the National Eagle Center in Wabasha to experience the annual winter gathering of eagles. Hundreds of bald eagles prefer to overwinter in the Wabasha area. March is the perfect time to witness their beauty! Our time at the center includes a private presentation with a live eagle. where there is another lovely vantage point overlooking the river to view the eagles. and for dessert, your flavor choice of PIE! $85 Includes: Motorcoach, lunch, admission, snacks on bus, gratuities, driver trip.